At Wittenborg, we value work experience highly. The opportunity for students to put theory into practice is crucial to their development, and it will give them a better sense of what ‘life after uni’ will be like. For business partners, our international students will contribute with fresh views on your business, and can help in addressing specific assignments. We currently have around 600 students from more than 80 countries enrolled on our programmes. Next to Work Placement, we also provide other business experience to our students: guest lectures, project weeks, company visits. 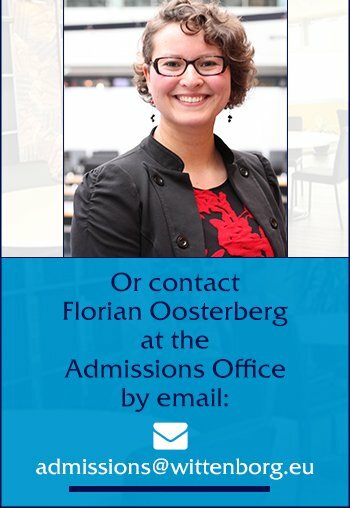 If you would like to engage a Wittenborg student and become a Wittenborg Partner, please contact us directly at adrianne@wittenborg.eu (for the Netherlands) or tim.birdsall@wittenborg.eu (For Austria). We will contact you and take you through the process. Every 6 weeks, a large number of our bachelor's and master's students carry out a 'project week'. This is an important part of their studies, as they are tasked with using the concepts and modules from the previous weeks of learning in the project, as well as looking forward to what is coming in their programmes. Each project week is different, and each programme has 6 project weeks per year. Projects come from our network of companies and organisations in Holland and Austria. They are based on real business cases, and we are always looking for projects for our students to work on. Wittenborg is constantly seeking companies to join this network. Project design document - what questions and topics will students work on during days 1, 2 & 3? Deliverables - what problems is the customer looking to address, and what outcomes are desired? Support - would it be possible for the customer to interact with the students during the project week to answer questions? Presentation - Agreement on dates when the customer can review the resulting presentations. Step 2 – Wittenborg creates a project design and sends 'pre-read' information to the project teams. Step 4 – Wittenborg faculty members debrief with customer. As a part of the project week we use 2 specific methods, which aim to give our students a long-term development of team building, team role skills and project management skills. The structure and duration of this method work is unique. Our customers are generally very impressed with the ideas and can learn from the students. The first type of project is the large project which is offered free of charge to the client. This is used by all the students of the project week (up to 160 students working in 24 teams). The second type of project is a paid project which is executed by a group of 15 to 30 students in 3 to 6 teams. This is a paid service which allows us to fast track projects, so that our customers can get their results promptly. This service costs the company €3,500, in view of the fact that we need to employ an extra faculty member to manage all the activities in step 3. From a business context, the project week is in essence equivalent to the first step of a full-blown consulting initiative, which would cost considerably more on the open market. The MBA programme for business professionals is a rolling programme which accepts participants on a module by module basis – which means you come into a team that is already busy learning. Modules are supported by virtual meeting and face-to-face seminars. See here for the full MBA portfolio, and click here for contact to the Euro-MBA support desk.